These ginger cookies are now part of my staple holiday baking line-up. I always have a ginger cookie as part of my line-up, but over the years, it has gone through several variations. The first version was a recipe from my brother's friend. 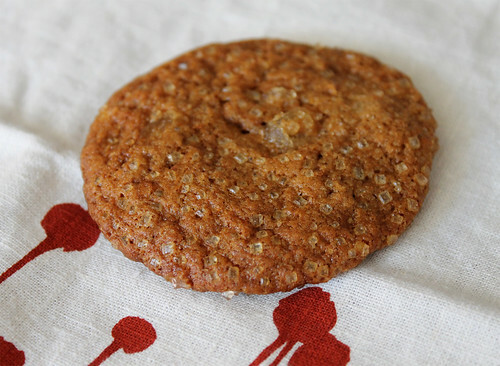 Big, soft and chewy, it was along the same lines as this ginger cookie recipe below, but a little less milder on the ginger and more molassey. A few years later, that recipe gave way to Martha Stewart's Chewy Chocolate-Gingerbread Cookies. I loved these. They were the perfect bite of spicy ginger and decadent, gooey chocolate, and the combination of the two was divine. Then I came across these ginger cookies last year from Alice Medrich's Chewy Gooey Crispy Crunchy Melt-in-Your-Mouth Cookies. 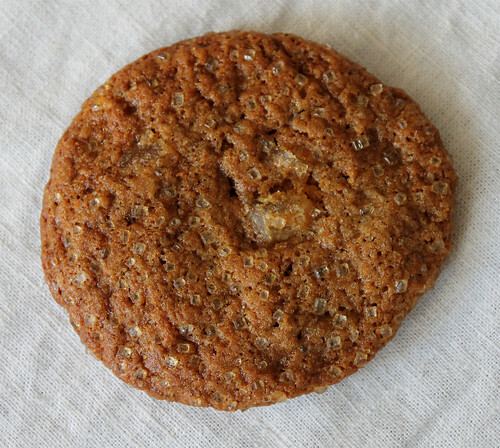 To me, it was the textually perfect cookie—crispy on the outside thanks to the turbinado sugar crust, and soft on the inside with just enough chew here and there from the big chunks of crystallized ginger. And wow, what flavour and heat it had! Not one, not two, but three kinds of ginger: fresh, ground, and crystallized. I haven’t looked back since and always rely on this recipe when making ginger cookies. I didn’t alter this recipe at all, and that is the power of any Alice Medrich recipe. 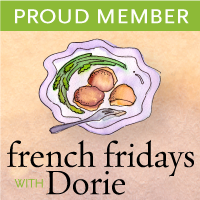 Medrich is a master when it comes to testing all her recipes to perfection, and I have to say, every recipe I’ve made of hers has come out perfectly, with no or very minor revisions (and mostly those revisions are for personal taste). Her Chewy Gooey book remains a cookie bible for me. Pages are starting to stick together as a victim of my baking escapes: molasses, sugar, eggs, flour, raw dough, they’ve all make their way into my book one way or another. And if you’re a big baker like myself, or know someone in your life who loves to bake, I urge you to pick up a copy as a fabulous holiday gift. Trust me, the recipient will thank you. And you too will be thankful for all the delicious cookies you’ll hopefully receive in return as they bake their way through the book! 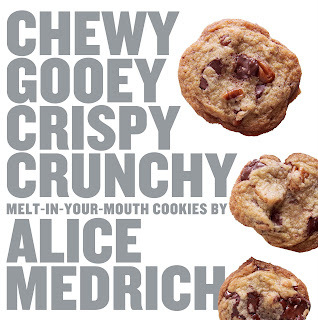 Excerpted from CHEWY GOOEY CRISPY CRUNCHY MELT-IN-YOUR-MOUTH COOKIES by Alice Medrich (Artisan Books). Copyright 2010. Preheat the oven to 350°F. Position racks in the upper and lower thirds of the oven. Line cookie sheets with parchment paper and set aside. Combine the flour, baking soda, ground ginger, cinnamon, allspice, and salt in a medium bowl and mix thoroughly with a whisk or fork. Combine the warm butter, molasses, sugars, fresh ginger, and egg in a large bowl and mix thoroughly. Add the flour mixture and ginger chunks and stir until incorporated. The dough will be soft. Form the dough into 1-inch balls (0.5 ounce dough for each). Roll the balls in the Demerara sugar and place them 2 inches apart on the lined cookie sheets. Bake for 10 to 12 minutes, or until the cookies puff up and crack on the surface and then begin to deflate in the oven. Rotate the sheets from top to bottom and from back to front halfway through the baking time to ensure even baking. For chewier cookies, remove them from the oven when at least half or more of the cookies have begun to deflate; for crunchier edges with chewy centres, bake for a minute or so longer. Set the pans or just the parchment sheets on racks to cool. Cool the cookies completely before storing. May be kept in an airtight container for several days.